Between 2009 and 2018, ten thousand persons were interviewed in Germany on behalf of UEBT about their awareness of biodiversity, their expectations on brands' respect for people and biodiversity, and their purchasing decisions. This page shows the responses of ordinary German people in the UEBT consumer survey. Street videos shooted in 2016, illustrate the survey outcomes, offering a unique and fun opportunity to view the evolution of the results. 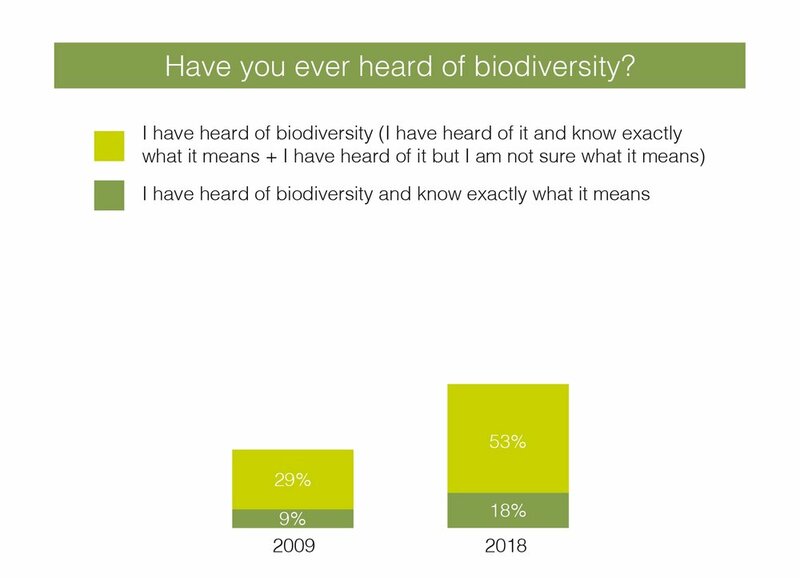 53% of German respondents have heard of biodiversity in 2018 up from only 29% in 2009. 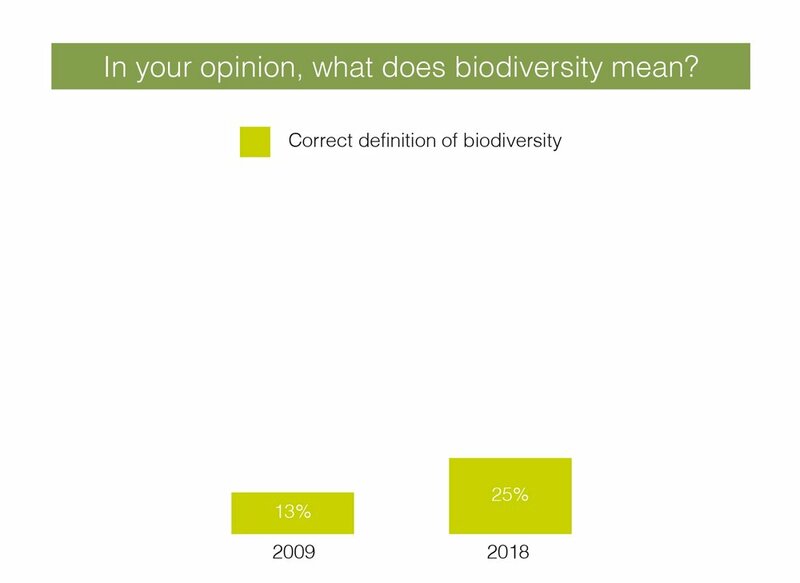 Even though the increase, mostly driven by young people, is significant (+24pts) and the highest among surveyed countries, the level of biodiversity awareness still remains low. Moreover, only 25% is able to define biodiversity correctly. Street videos 2016 - Question: Have you ever heard of biodiversity and what do you think it means? Among German consumers there is a strong consciousness that it is humans’ responsibility as a whole to protect nature (88%), slightly ahead from involvement on a personal level (84%). Nonetheless, fewer German respondents think that they will be personally affected by the disappearing of biodiversity. 74% of German consumers interviewed for the survey, believe that companies have a moral obligation to make sure they have a positive impact on society, people and biodiversity. 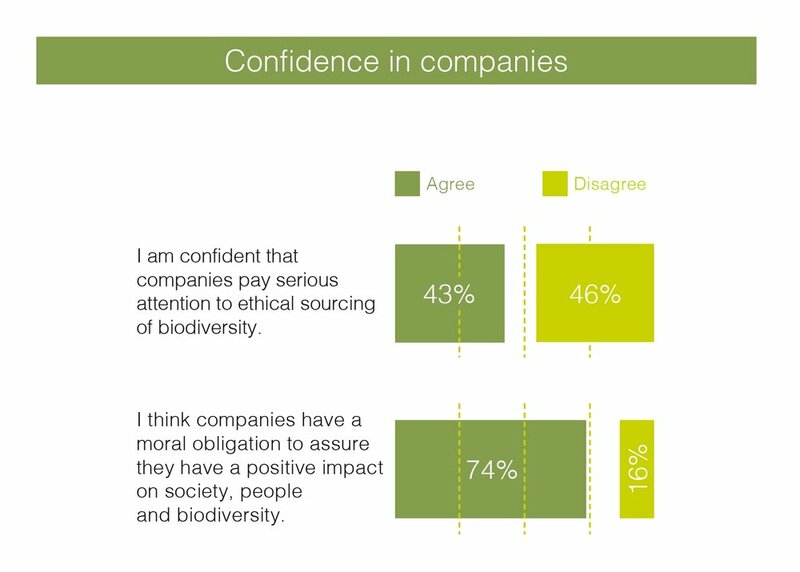 However, only 43% of German respondents say they are confident companies pay serious attention to ethical sourcing of biodiversity. Germans along with Brazilians have more trust in their companies than other countries surveyed where confidence levels are even lower. German consumers expect elements of reassurance on companies' involvement in the respect of biodiversity They especially wish to be informed about concrete actions companies take to ensure they respect biodiversity and people when they source natural ingredients. German consumers, request a lot of information on packaging but slightly less than their French neighbours. German respondents are more attentive about the list of ingredients contained in the product and the impact it has on biodiversity. The need to know the origin of products seems less important in Germany than in France where it is a must-have on products. Companies involvement in respecting biodiversity and people is a driver of purchase as most consumers surveyed in Germany (64%) believe that they can positively impact society by buying products from companies that respect biodiversity and people. Also, 68% feels good when buying such a product. However, only 56% of respondents buy products from company that they know pay attention to biodiversity, thus allowing a great potential of growth for companies respecting biodiversity and people. In 2018, when asked about brands that respect biodiversity, only 44% was capable of providing the name of at least one brand. This was the lowest level among surveyed countries. Alnatura, Weleda and Nivea lead the ranking. 2016 Street interviews confirmed at that time that no brand in Germany was clearly positioned on that topic as the level of responses was very low.